Visitors of the CommunicAsia exhibition that was opened on the 17-th of June were the first who get to know about SonyEricsson T200. But it doesn't mean that the new model is aimed only to the Asiatic market. In reality only the model T202 with Chinese language support will be launched there, the other part of the world already in October will see the model T200. According to the SonyEricsson classification, new phones in the T series (T200, T300 and T600) are considered the phones of the fashion class. T 200 is the low-level phone in this line, so it would be sold at a reasonable price. Let's look at this model more closely. (I'd like to make a reservation that I had only a prototype of the new phone, not a serial product. Nevertheless it's simple to estimate the potential of T200 by now, besides the software of the tested phone was practically ready for operation. In the near future I definitely test the commercial sample and write additionally about my impressions here.). The model T200 is firstly distinguished by its design. The phone is comparatively small (105x48x22), rather light (85g) and handy. It will be produced in two colours: ebony black and ice blue. But only the colour of the front and a rim around it will differ, rear cover and sides will be always of the same metallic colour. Let's look at the front of the phone. We can see a light-emitting diode above the phone, the dynamic hole (earpiece) under it, lower, as you understand, positioned a display. The blue backlighting is so bright that you can use the phone as a torch in the dark. Sometimes eyes get tired from such bright lighting. The display can contain up to 3 text lines (22 English or 20 Russian symbols) and two lines of housekeeping information, the type size doesn't change. You will see a wallpaper and some icons in the standby mode. You can set a doze mode, then you'll find only an indicator of the signal level and the battery level and the time. Now it's traditionally for company to make the linear battery level indicator, not stepwise. The keypad is made of plastic, middle-size keys are well-spaced. It's easy to press the keys, in spite of a mechanical flick, you don't feel any tension in your fingers. The 4-positioned navigation key is also comfortable due to the special jut at the top. There is a special (blue) key for Wap browsing. On the left side placed a double key made of rubber. It is used for the volume regulation. With a help of it you can also know the information about date, time, the used profile and the condition of GPRS connection. There is a cutoff for the additional outside antenna on the rear cover of the phone, near it the hole for a strap is located. A strap allows to wear the phone both on the hand and around a neck. A battery of T200 is separate from the rear cover of the phone. However the construction is very reliable! There is no any backslash, it doesn't even crunch if one doesn't press powerfully on sides. The phone is powered by a Li-Ion battery (BST-24) of 700 mAh capacity. According to the manufacturer declarations it can provide an autonomy of 200 hours in the stanby mode and 11 hours in the talk mode. The results of my practical test showed that in reality it worked 2 days in case of 40 minutes of talking (MTS-network) and 45 minutes of usage in standby mode (games, organizer and alarm-clock). If you talk less the phone can work about 4 days. The time of the battery recharging is around 1.5 (2 hours according to the manufacturers). An interface socket is situated below the phone. In comparison with other models it doesn't change much. 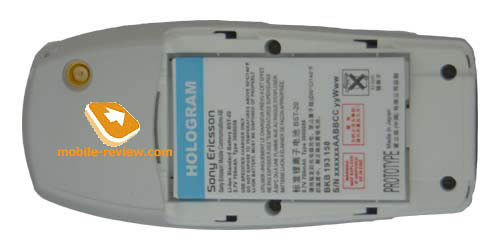 So all standard chargers and almost all accessories are compatible (see more about accessories compatibility on the site http:/www.sonyericsson.com/ (section Global Support)). The manufacturer promotes this model in the set with MCA-10 camera which allows to take images and to view them on the phone screen. (The camera isn't a part of a standard set). Before I begin to describe different functions of the handset I'd like to pay your attention that T200 is the only phone of this level that has a triband. There is a full Russian text input though the Russian T9 dictionary (predictive text input) is absent. A menu structure is ordinary. There are several bookmarks with the main items of the menu, submenus look like a numbered list. This numbering allows to use the quick navigation. Let me start to describe the main phone functions. Phonebook. Apart from the SIM-card memory one can use the memory of the phone which can keep up to 100 entries with one field for each. It's possible to associate one small graphic image and one melody with a name. There are several default images in the phone but you can also set yours with a help of MCA-10. The phone has 4 predefined ring tones and 11 melodies, the user can also create his own one (up to 8 melodies). Unfortunately it's not too much. One can arrange the names and phone numbers saved in the phone book into several caller groups. However, it's impossible to associate a specific ring tone with a group. But you can use this feature when you do a mass list of SMS messages. You can't view the SIM-card and the phone memory in one time. Only phone numbers from the phone memory are loading by default. You need to choose a special item in the menu to find an entry from the SIM-card. During incoming calls a name from both memories can be automatically associated with the phone number. It is possible to copy all data from a SIM-card memory to the phone memory. When you add a new name to the phone book you can press a left navigation key and then you'll have an opportunity to choose a phone number from the call list, the phone or SIM-card memory (it depends on the memory you are working with now). Messages. T 200 supports EMS messages, connected messages, chat function. The user can make templates (up to 10). The mail client is absent. But you can put a gateway address in the settings and in this case you can send short messages to the e-mail addresses (a gateway in the operating network). You can store up to 10 SMS messages in the phone memory, also you can use a SIM-card memory (messages that are kept there are marked with a special icon (sign). Call log. As always you can view your call lists in this submenu. This phone has two call lists: the list of missed calls (up to 10 numbers) and the general list (up to 20 numbers). Using this option you can also view the date and time of each call. If you reject an incoming call this number will be registered in the list of missing calls. The counters of call duration and the volume of sent and received data are activated here. Parameters. Almost all phone settings can be switched on here, ring settings in particular (any tone for the alarm-clock). You can create your own melody only with a help of consecutive number sets (without melody list). T200 has a minute timer that works within the talk. Profiles are standard. I have nothing to add to that. There are many settings of the screen in this handset. You can adjust contrast, set wallpaper (up to 6, preview is available), create a greeting and regulate a backlighting. You can set values for package data exchange (GPRS 3+1). It can be used not just for viewing WAP-resources or sending SMS messages but also for being in the Internet (from PC via the cable). This function works excellent, no criticism. Extras. There are several useful features in this submenu. Here is an organizer located. It can store up to 100 notes, each one has a heading, small text description, certain time of the beginning and the end, repeat time (daily, weekly, every 2 weeks, monthly, yearly). You can also add a time zone to each note that is very convenient during the trips. T200 supports two ways of looking through the calendar - by week and month. There is a function of the alarm deactivation in case if the phone is switched off in the organizer settings. Besides, there is an automatic switching on of the reminder that informs about the profile changing when the specific event comes. The phone has two alarm clocks: one of them sounds once, the other has the recurring settings by the days of the week. It works even when the phone is switched off. There is also a countdown timer and a stop-watch here. A calculator is ordinary and not very convenient. Pictures. A standard set of different pictures, that one can use in the phone book and in EMS-messages, is located here. The pictures are divided in several thematic groups. You can view the whole list of the phone numbers that are associated with these pictures and change these numbers immediately. There are 5 games in the handset: Ballpop, Chess, Path, Pulldown and Tennis. Ballpop is a variant of Archanoid. It is possible to play but in my prototype the racket was slow and annoyed me greatly. You can play chess only with other user (a human), your phone can't be the second player. Path is a logical game, you should connect two pairs of figures. Pulldown is also a logical game. Tennis …. I think you know what it is, so let me miss it. WAP. WAP-browser in version 1.2.1 with usual settings. Shortcuts. You can set shortcuts for often used functions. This feature is standard for handsets from Ericsson. The quality of connection is like in other models of SonyEricsson: the sound is good but there are some problems in the places where there is a loud noise, in this case the person who you are talking to might not hear you. However, I think that only prototype has these shortcomings and commercial samples wouldn't have such defect. T200 has a quite good vibration alert. You can feel it in the shirt and in the bag, you can even hear the sounds of vibration in silence. The sound volume is quite enough to hear almost everywhere, but in noisy places you can omit few calls. Vibration alert is very helpful in this situation. The use of powerful vibration alert and an average sound volume is typically for some other models from Ericsson too. In general, T200 reminds me T65i by its characteristics. T200 is simpler of course, but I think that T65 is the base platform here. A nice design, three bands and no clear drawbacks - all these features make the phone very attractive. Besides, the price is not very high. At the beginning of selling it would cost 150-200$ that is rather expensive but the price would drop to 100-130$. How quick it would be? It depends on the selling of the model. I presume that it might be in 1 or 2 months after the beginning of selling. The same situation was with A2618, if you remember it cost 150$ when it appeared in shops. SonyEricsoon T200 could be an interesting offer in the middle class phones though it is a fashion handset according to the manufacturer classification. The phone turned out to be a balanced one. 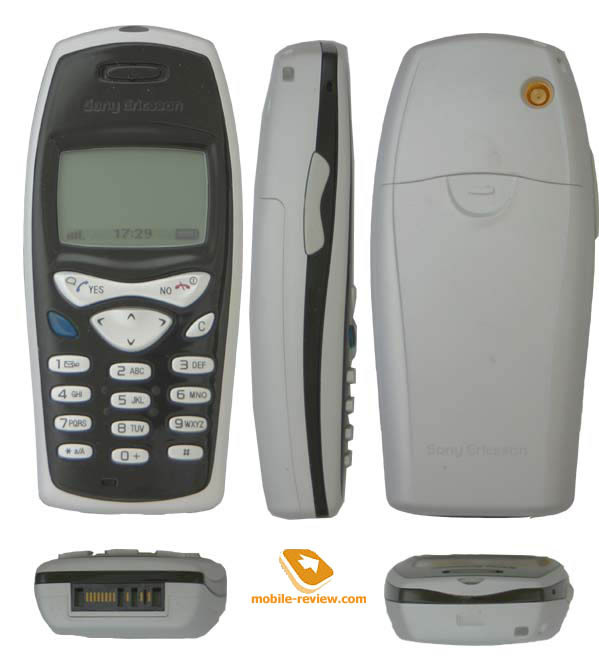 It's very pleasant because it the first phone in the new line from SonyEricsson.